I am a local born and bred in the Maldives. Once I was searching online for the information of local culture in the Maldives and was not satisfied with the existing articles. The topic is very general but today I decided start writing about the Maldivian culture. I am not intending to complete this article in one go, rather to divide it into components and update the post as I get time. Currently I am on a very busy schedule at office but I am curious enough to spare some time to kick off this topic. Being a sea based country the people of Maldives are heavily dependent on fish and tuna is their favourite. Skipper of the fishing boat wakes up early morning and visits fellow crew members waking them up. Every fisherman would bring a tortilla prepared by the housewife, either sweet or spicy. Fishing boat would first travel to a reef to catch live bait fish with a net and before sunrise they would sail to the open waters looking for hungry schools of tuna. People would stare at horizon to spot sea birds which indicate presence of fish. In the ancient days the boats were powered only by sail, so it took hours to reach a good spot but fisherman never gave up in any climate. Their bodies were tough and strong. Every fish is caught by pole and line, the environmentally friendly fishing which is still the practice in Maldives. After spending the whole morning and the fisherman would return to the island in late afternoon. The islanders would gather at the beach to welcome fishing boats and people enjoy seeing the catch. The fisherman would clean the fish at beach, take them to their houses and cut for the dish. Once that is done the part of fisherman is over and rest is taken care by the housewife who cooks and serves a hot meal to the husband and children. After dinner the fisherman would pray and take rest, visit friends before going to bed to start the next day at fishing. 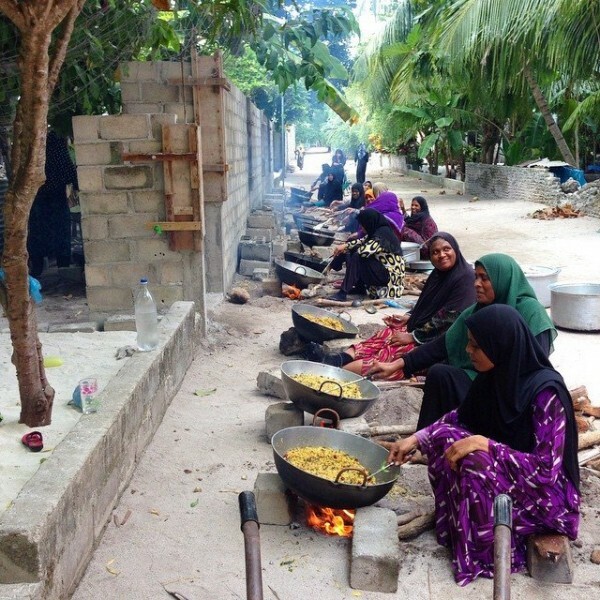 Maldives is a sunni muslim country and holy month of Ramazan is observed every year. It is now a few weeks before the Ramazan this year. I can see in many islands the locals are getting ready to welcome the season. Middle income level people are renewing the home furniture. Less fortunate people would deep clean the house, kitchen and furniture. In the ancient days the kitchens had wooden racks to smoke tuna which turns black with smoke. Every year this rack gets a deep cleaning and that happens for Ramazan. In this season people are also buying new kitchen and tableware. The Ramazan culture also varies at different islands. Some islands would prepare the spices way on advance, the women would gather at one place and perform like a show. In Ramazan the people would take their dinner few hours before dusk and fasts till sunset. There is no meal in between. After tolerating hours without food or drinks the breakfast becomes a happy time. There are many varieties and tasteful dishes as much as people can afford. There would be at least one type of fresh juice, the most common is water melon. Demand for water melon goes several folds in this season. The island of Thoddoo is known to make good business during this season, they mass produce water melons and distributes all over the country. Along with water melon there would be curries and snacks that varies at different days. At the time of breakfast the men gets priority on the feast, ladies do the cooking and they join the feast after men. Usually houses are small and dinner table doesn’t have enough space for all households. People breaks fasting with date fruit followed by fresh juice. Not all would have a full breakfast right away. The more religious ones take dates and juice then go mosque for prayers. Upon return from prayers they would have the joy of a full meal. The traditional education system was mostly about literacy and religious study. 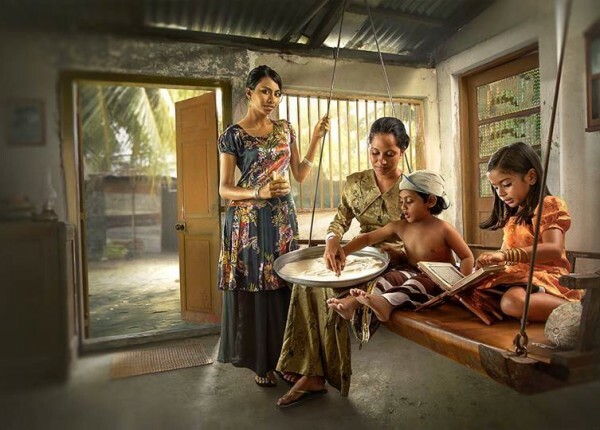 In 1980s there were schools in Maldives, prior to that was the culture of teaching at home. Kids would attend houses of educated people and they would give lessons free of charge. At home the mother usually gave home tuition. A thin wooden box filled with sand was used to draw in letters of alphabet to practice at home, both local language Dhivehi and Arabic. It was not the age of pen and paper. The students used wooden board kept on the lap to write down. In the ancient times there were no hotels and lodging for visitors coming from other islands. People would stay with friends while on another island. But not all would have friends in each of the several islands. Bad weather conditions sometimes force fishermen and other travelers to anchor at other islands. That is when you need help. If you don’t have any then you would wait at the beach side or on the boat. Locals would notice the unfamiliar boat, notice movements of the people. If the residents realize that the boat got no one from who have local friends, someone would eventually go and check on their conditions. They befriend each other and offer stay and provide other means of help. That was how people from different islands got to know each other and made friends in the ancient culture of the Maldives. But, the modern lifestyle is now different. There are hotels and guesthouses in most of the islands, or at least rooms for rent. You pay and obtain whatever service you may want and you leave. Next day you would not know each other. Today you meet strangers and befriend on facebook. Life and culture has changed much.